Facebook is a big platform where you can do a lot of advertising, as this is the only platform that boasts of the largest user base and the highest number of active users. So there is a lot of potential and scope in advertising on Facebook. Experienced advertisers know that FACEBOOK AD SPLIT TESTING is necessary to find what works and what doesn’t. In split testing, you can compare and contrast the results of two different audiences that are shown the same ad. Facebook officially launched Split Testing recently. With split testing being done manually before it was formally introduced, advertisers had no way to prevent the same person being shown both the ads and this caused a lot of data to give false results. So Facebook found a solution to make this authentic and professional. 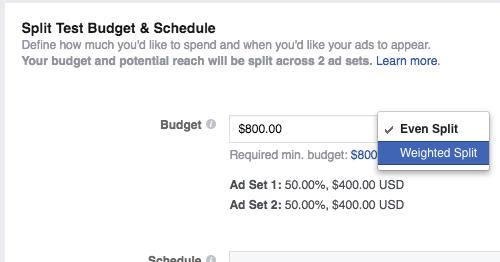 Let us see how Facebook Ad Split Testing works. 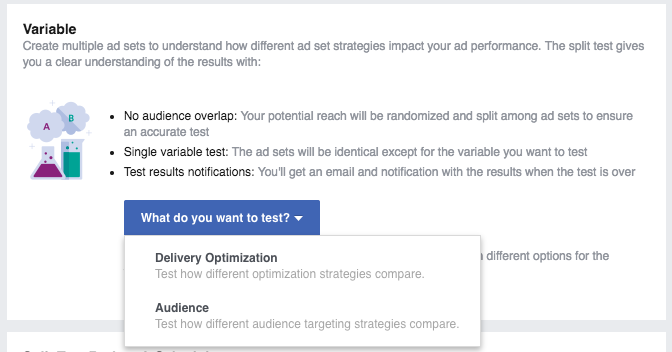 Facebook developed an algorithm that ensures your audience of two different ads does not overlap. You get to decide how the ads get shown to the separate audiences. For those who have a business manager account on Facecbook, split testing is made available to them as well. 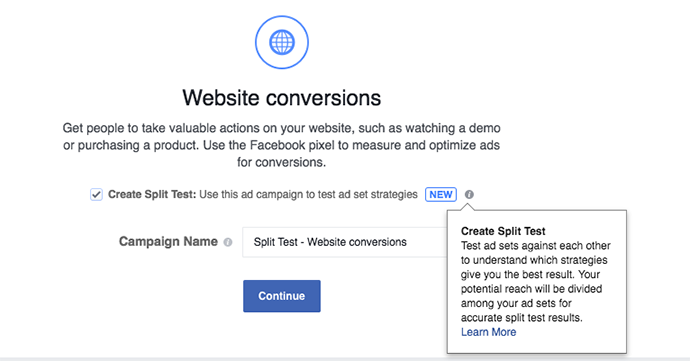 At present, Facebook Ad Split Testing is currently available for website conversions, lead generation, and mobile app installations campaigns. Automatic vs manual bid amount. There is a minimum budget that you need to fix in order to collect sufficient data for test execution. According to Facebook, schedules must lie within 3-14 days for optimum results. Upon test completion, you are notified. Step 1.) While creating Campaigns when you use website conversions, app installs or lead generations, you can create split tests as shown in the image. Step 2.) Before everything else, you must choose your variables for split testing. Once you choose ‘Delivery Optimization’, you will be presented with a delivery optimization section with Ad set 1 and Ad set 2. You will be required to make at least one variation between different ad sets. You can choose variations like optimizing for link clicks vs web conversions or 1-day conversion window vs 7-day conversions window, etc. you may be creating two ad sets as earlier, but if you want a third ad in the comparison, then click on ‘Test another ad set’ option. 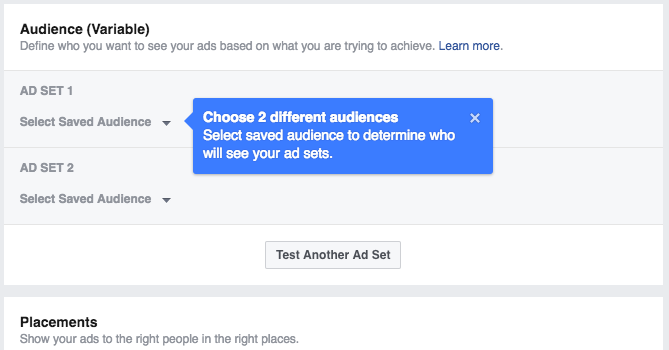 If you choose the ‘Audience’ variable, you will be required to select competing audiences. Step 3) Having done this, you need to define the test budget. 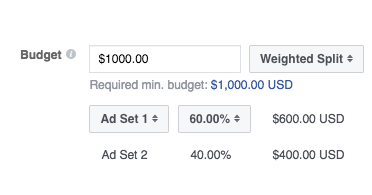 In the weighted budget option, it allows you to choose the ratio of the budget on the ad which you think is appropriate. You should, however, see that while the budget allocation to an ad is in implementation, so you much create a sufficient sample size. Now you will be required to create your ad and this ad is going to be deployed across the ad sets in your split test. Now let us see in what ways you can use your ad sets. There are some really unique ways in which the split testing can be made useful. Let’s take a look. Test Audience – One thing you must always take care of is you should not combine multiple audiences with the same ad set. The Facebook Ad Split Testing feature ensures to keep the two set of audience absolutely isolated with the ad set involving the other set of audience. This is the most effective way to separate one audience set from the other.Here are a few examples of audiences to compare. Lookalike audience like the one based on sales versus the one based on registrationsAnd so many more combinations can be made. While it is true that there is no universal answer for all this, but this depends entirely on your choice. You should find it for yourself. 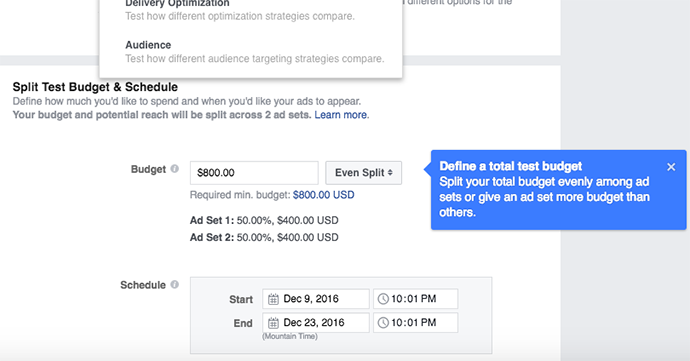 And Facebook Ad Split Testing feature makes it even easier for you to explore and gives you perfect data to Optimize your Results. One thing you should definitely split test for yourself is the optimization of ‘Link Clicks’ versus ‘Website Conversion Optimizations’. This is essential to test because you get to know whether the conversion you get on your pixel is in the initial stages of optimization or not. when the right situations show up. By right situation, I mean the best relevant audience. Apart from all this, you can also test Facebook’s New Optimization Windows. 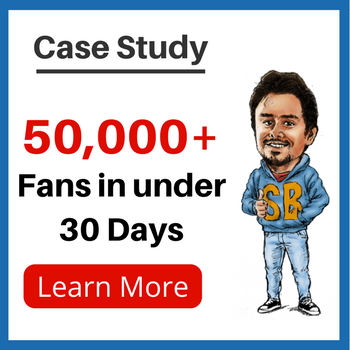 Logically, for conversions, you can use a 1-day window for those that take place in a day itself and for those that take place in a week, you can use 7 days. Testing them yourself will give you better idea in real time. Most of the advertisers go for Automatic and the rest for Manual, but the best of those are who study both by comparing the automatic versus manual bidding and see which is beneficial for their business. 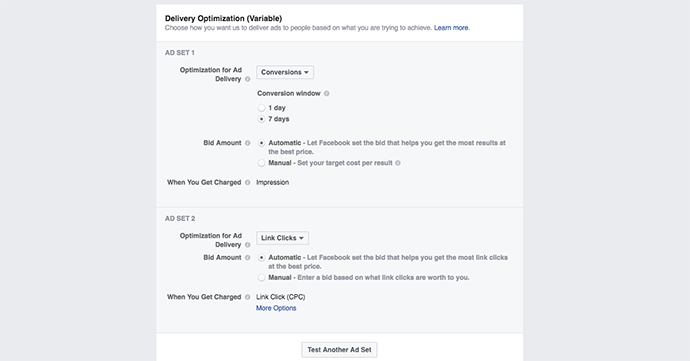 Facebook Ad Split Testing is a must do for your Business. 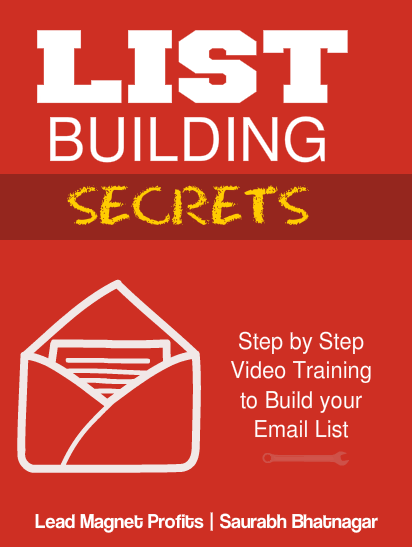 You should Split Test each & every Single aspect of your Ad creation process. As ONLY this can give you the Best Data of What is Working for you. You can keep asking questions to yourself or to any Guru of what things work. But what is Really important is to know is What is Working for you. I hope this was one helpful article for you. And you will be highly benefitted from it. So let me know in the comments what you think and also if you need any clarifications. Also, it would be great if you can share the Article with your Business friends, other Facebook Advertisers or may be in Forums or Groups where the Audience can be benefitted from reading this. 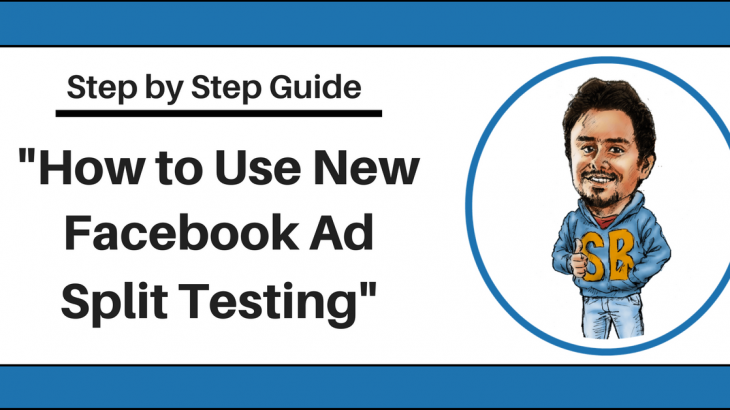 Facebook, Step by Step Guide facebook, facebook ad split testing, facebook ads, facebook ads split testing, facebook ads testing, facebook testing. permalink.